Learn how to freewrite. Too many writers are hindered by perfectionism in drafting. Once we realize that a first draft isn’t the end, that we have an unlimited number of revisions ahead, we can be free to write badly. Remember, the first step is getting it down; getting it right comes later. Freewriting is a technique that liberates the writer from the encumbrance of correctness. 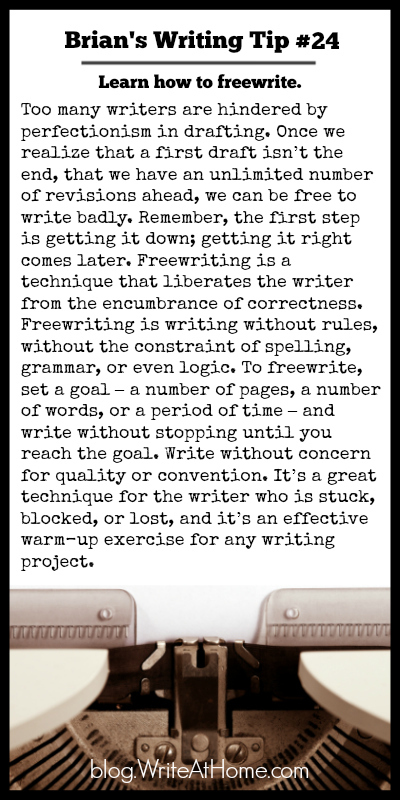 Freewriting is writing without rules, without the constraint of spelling, grammar, or even logic. To freewrite, set a goal – a number of pages, a number of words, or a period of time – and write without stopping until you reach the goal. Write without concern for quality or convention. It’s a great technique for the writer who is stuck, blocked, or lost, and it’s an effective warm-up exercise for any writing project.